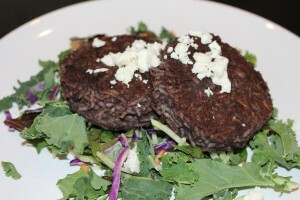 Black Bean Patties - Combine beans and rice for a complete protein you will be getting all the essential nutrients your body need for good health. Place beans in a frying pan and cook for 8 min at medium heat. Shape the bean patties by hand or use a round cookie cutter. Serve on a bed of mixed greens and topped it up with fresh feta cheese, goat cheese or parmesan cheese.